Paris and Bridgewater, New Jersey – Capgemini and IGATE today announced that they have entered into a definitive merger agreement under which Capgemini will acquire IGATE for a cash consideration of $48 per share. The transaction will amount to $4.0 billion and is expected to be immediately accretive to Capgemini’s normalized Earnings Per Share (EPS)1. 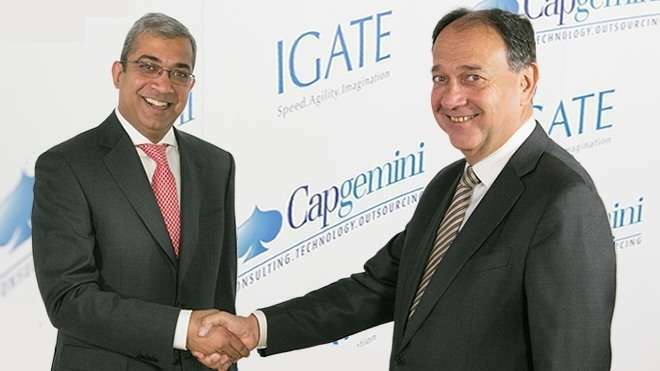 The merger agreement has been approved unanimously by both Capgemini’s and IGATE’s Board of Directors. The transaction has also been approved by the written consent of shareholders holding a majority of IGATE’s shares. IGATE is a prominent US-listed technology and services company headquartered in New Jersey with 2014 revenues of $1.3 billion, double-digit growth and a 19% operating margin2. North America is IGATE’s largest market representing 79% of revenues in 2014 followed by Europe (14%) and Asia-Pacific (7%). IGATE strengthens Capgemini’s key businesses in application and infrastructure services as well as BPO and engineering services. Moreover, the transaction enriches Capgemini’s portfolio with new flagship clients such as General Electric and Royal Bank of Canada. This transaction would lead to a group with an estimated combined revenue of €12.5 billion in 2015, an operating margin above 10% and around 190,000 employees. The combined Group will pass the 100,000 employees landmark in its Rightshore® delivery centers in 2015. This transaction fulfills one of the essential components of Capgemini’s strategy in expanding its presence in the North American market.